WonderSoft Multimedia Solutions (WMS) has garnered a team of Magento developers, unmatched at developing Magento apps which perfectly cater to you. Consumer market demands new stuff every now and then, and we are the Magento Development Company who can do that for your business. WonderSoft Multimedia Solution’s Magento development team has delivered 100+ projects with picturesque excellence. Since we entered the industry, we have gradually become the go-to company for custom Magento website development due to the host of services we offer. We have a team of Magento developers who have experienced development cycles with this amazing commerce platform – Magento. Hire Magento developers from WMS will benefit your cost effectiveness as well as efficiency to improve the overall productivity of the online stores. Magento is a fully-featured eCommerce software platform developed on an open-source technology. Magneto is independent from third party plug-ins and is regarded as one of the most sought after eCommerce platforms by developers. WMS has been developing unique, reliable and secure Magento applications which are scaled with latest technologies since its inception. We have worked on numerous projects successfully and its natural that you would hire Magento Developers from an experienced entity. WMS Magento Developers deploy latest technology to yield powerful features for feature-rich themes in Magento. WMS outsource resources which are not just apt at different technologies, but our hiring model lets you insource them easily as well. 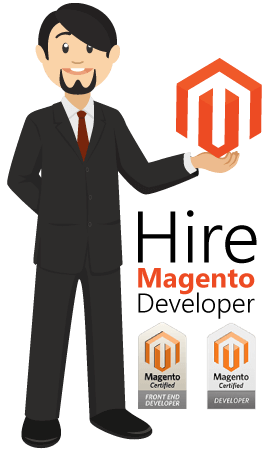 Our pool of professional Magento Developers and experts consists of individuals who are well-learned of all nook-and-crannies of the domain. We provide full source code access to our clients, error handling, code integration techniques, and various other features. We ensure that even though we are developing, project stays yours!